Richard Ned Lebow admits, in his very insightful review of my book on the Iraq war, that his initial reaction was to scoff at my counterfactual about an Al Gore presidency taking the same path to war, “until (he) read the book.” I suspect anyone who takes the time to read the book will recognize the effort I invested in getting the ‘facts’ and the history right. The application of comparative counterfactual methodology was the ideal tool to construct, in my view, a more compelling, complete, historically accurate, logically informed, and theoretically grounded account of the path-dependent momentum that guided the coalition to war in 2003. I suspect the book will have a very hard time getting any real traction in academic or policy communities, for reasons noted in Lebow’s review and covered at length in my conclusion: the arguments contradict very entrenched (and politically motivated) ‘memories’ of what transpired. Democrats are unlikely to accept ‘any’ responsibility for the decisions, intelligence assessments or general threat narrative that led to war, and Republicans are very happy to distance themselves from the ‘neocons’ whom, they claim, hijacked U.S. foreign policy. Similarly, many scholars will reject my version of history because it directly challenges their widely accepted, and very popular first-image (leadership) theories of the war. Most people are comforted by the thought that a relatively simple change in leadership would have changed (or will change) foreign policies. With these systemic biases in mind, I am very grateful to Lebow for his careful and balanced comments on the book and the methodology. Frank Harvey is to be congratulated for producing an exemplary book. 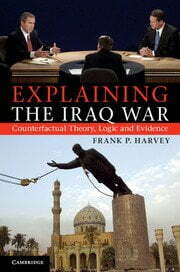 It makes sophisticated use of counterfactual argumentation to challenge the conventional wisdom about the causes of the Anglo-American invasion of Iraq. For methodological and substantive reasons it should be read by everyone with an interest in foreign policy. Any assertion of cause implies that, ceteris paribus, the outcome in question would not have occurred in its absence. In circumstances where context or the “lessons” of the past are important or determining – which describes most historical events of interest – statistical tests are meaningless as the “cases” that constitute any data set would be neither comparable nor independent. We can only evaluate causal claims through intra-case comparison, of which counterfactual argumentation is a variant. Historical intra-case comparison is possible when we have closely grouped events or decisions in which key features of context are constant. Austro-Hungarian policy in the July 1914 crisis is a case in point. The government had considered war with Serbia on four occasions between 1911 and 1914, but only drew its sword on the last occasion. We can plausibly argue that novel features of context – the nature of the provocation and the absence of Franz Ferdinand from the decisionmaking process — were determining. In most decisions or events of interest we must introduce intra-case comparison through counterfactual experimentation, as Harvey does. A little more than a decade ago, the world’s leading academic experts on terrorism could be gathered in a not very large conference room to discuss the state of the field. As a relatively junior researcher at the United States Institute of Peace at the time, I was in such a room several times. The gathered experts rued the lack of attention most academics paid to the phenomenon of terrorism. Mainstream political science of the time was wedded to understanding the actions of states. With the exception of a few pioneers such as Martha Crenshaw and David Rapoport, the view of many was that terrorism was properly seen as the province of diplomats, intelligence operatives and abnormal psychologists.